How about this for a quick-hit result. Hitting the banks of a target water near his home in northeast France after a shift at work, Solar Tackle team member Thomas Mascha landed this 45lb 10oz common in just a couple of hours before packing up and heading home. “Time was tight and so I’d already prepared some PVA sticks of Solar’s Candy Floss Up & Down Mix and my rigs were ready to go, baited with Candy Floss snowman hook baits,” explains Thomas. 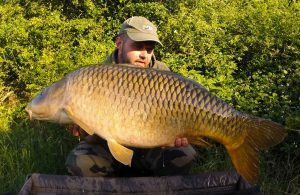 “I knew the area that I wanted to be in and as soon as I arrived in the swim I got the rods out within minutes, and then scattered a handful of prepared Blitz Mix particles over the top.